Massaging different parts of your body is the best way to reduce stress, relieve muscle tensions, relieve soreness and muscle pain, improve sleep and overall mental as well as physical health and a lot more. Visiting an expensive spa for this is quite not possible in our daily routine. So what if you get the same comfort of relaxation at home by spending only a few pennies? Isn’t it an awesome thing? Of course Yes. 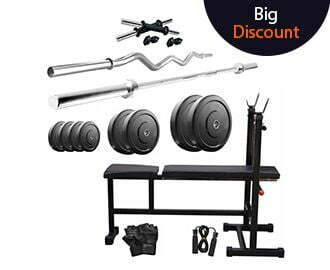 Ranging from body massager machines to face massager machines and also leg and foot massager machine, everything is now available in this technological era. All you can buy very easily to get the amazing benefits of spa-like massage from the comfort of your home at very cost-effective prices. So, welcome to the blog that we have bring for you with the best models of Foot and Calf Massagers you can buy to use at home. Foot and Calf Massagers are especially used to make you get relief from pain and stiffness on your foot and calf. And it is best for the regular exercise people, athletes, sports person, and even for those who experience the achy feet. 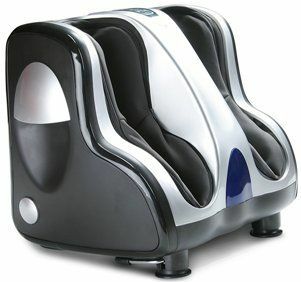 Foot and Calf Massagers ultimately relax you and also treat the soreness and stiffness in your feet and legs. So, getting a foot and calf massage is extremely best to get more relaxation and relief from the stress gathered on the legs area. How Foot and Calf Massagers Work? Foot and Calf massagers are designed to work on the leg area especially on feet, calves, and ankles. These are the chair-type machines that massage your legs area while sitting down in it. Usually, it comes in different shapes and styles, but the most popular one is the double massager where both your legs are placed into the machine that completely surrounds your feet and the back of the legs to halfway up the calf. And thus you can get a perfect leg massage with this machine. Here is a quick video demonstrating how Foot and Calf Massagers work. Operation Mode- The foot and calf massagers generally come with two operation modes- Manual and Automatic. With manual operation mode, you will have to manage the buttons or scroll feature manually to get the massage. And on the other hand, the foot and calf massagers with automatic operation mode functions automatically. So you can choose accordingly as per your ease and convenience. Size and weight- This is the most important point to consider if you are buying the foot and calf massager for home use. If you want to fix it at one single place only, go for the heavier models. And if you need something portable, then go for the lighter and compact models. Mechanism- Different models come with different working mechanism. Some works as vibrators, and some works on the principle of kneading. So what you like the most, you can choose accordingly. Heat Function and Variable Massage Speeds- It is preferable to choose the model with variable speed settings as well as heat function so that you can get a massage in a more impeccable manner. The heat function helps to release the stress on the tight muscles. They also play an important role in providing relaxation to the limbs. Comfort feature- The foot and calf massagers come with the cushion surface that offers ultimate comfort to the affected portion of the limbs. The Soft foam is injected with the gel and or plastic pads that provide comfort during the process of massage. Non-slippery foot Pads- Also check whether the machine has pads or not and even the machine with non-slippery foot placements are the ideal options. 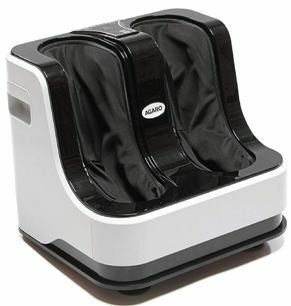 I am sure, now are very clear about the foot and calf massagers, its working mechanism, benefits, and features. But still, if you are confused on deciding which one is excellent and perfect for you, the blog is there for you. Here, we have lined up the best models of foot and calf massagers with distinct features and prices. So, just go through the list and thorough review of each model to make your best pick. This foot and calf massager from Robotouch is a complete leg massage solution including food and calf areas, and that’s why comes in the top of our list. With its novel appearance and stylish design, it not only gives an aesthetic look but also offers a great massage to your leg area. The Robotouch Classic Plus massager has been designed in two sections the up and down section with overturn function. It combines the intense kneading and vibratory reflexology massage that takes away your pain around the leg and feet area in few minutes. This is another best model of foot and calf massagers from the brand Lifelong. With its flexible rubber kneading pads, you can get an absolute spa-like massage experience. It comes with the roller massage technique that perfectly massages your foot area along with ankles and calf. It is also equipped with heat and vibration technologies that you can use accordingly on the basis of your preference. This Lifelong Foot and Calf Massager also has 4 customizable massage modes including kneading, vibrating, rolling, and, heating programs. With its special design to provide electronic simulation on the required pressure points at the sides of the sole, it helps your feet to get relax, maintains blood pressure, strengthens muscles, improve balance and flexibility. This is another smart choice for foot and calf massagers that work amazingly on achy feet and sored legs. This high-quality electric massager comes with a number of awesome features to provide more relaxing foot and calf massage. The number of preset programs and service levels in it works perfectly for different stress and muscle type. When it comes to design, it’s fashionable appearance is the most eye-catching one. With the Rubber Kneading Pads, it effectively massages foot, ankle, and calf at the same time. It works on the principle of reflexology for easing the tensioned muscles. 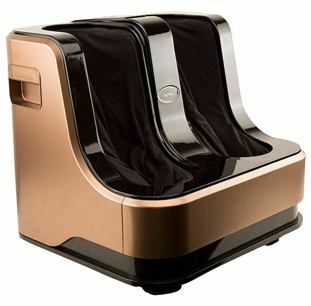 This foot and calf massager from JSB has 2-speed settings and vibratory mode that you can choose accordingly depending upon your comfort level. The very best part is that it can recline up to 45 degrees and can be used while sitting or reclining on a chair. This foot and calf massager from HealthSense comes next in our list for its amazing wonder on leg and foot pain. 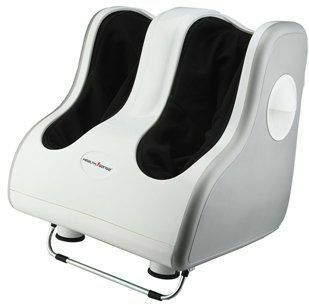 With lots of awesome features, it promises to deliver the best leg, foot, and calf massage with the utmost relaxation. The machine is designed in such a way that provides electronic stimulation on the required pressure points around the leg and foot areas. And the very best part is that you can adjust the massage intensity accordingly. 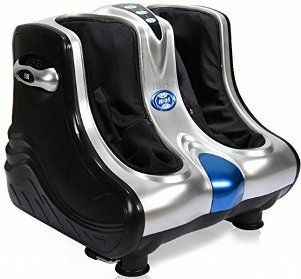 This is really an innovative foot and calf massager with unbeatable customized massage features. It comes with 4 flexible kneading discs that knead lower foot and calf very effectively. This massager also combines the kneading and vibratory actions to give you the most relaxing massage experience. With the deliberately placed buttons on the switch panels, you can easily control the massage function with ease. This is another great piece of technology from the brand Agaro. This foot and calf massager is one of the complete devices to bring your massage experience to the next level. It comes with specifically designed massaging pads to recreate the sensation of nice wavy massage on your feet, calves, and ankles. The great combination of kneading and vibratory actions gives you the most relaxing and revitalizing massage, along with the beneficial reflexology effect. The JSB HF68 Foot and Calf Massager Machine is a multi-functional massager with lots of awesome massaging features. It is absolutely a decent choice for those who have lower body circulation problems. It comes with the kneading pads for an in-depth therapeutic massage. This massager helps you to get a relaxing kneading massage on the feet, ankles, calves, thighs, and arms. It can also be used as a dedicated massager for calves or thigh when you lie down on a flat surface for massaging these areas. This is all about our best picks for the latest models of foot and calf massagers featuring great technology to use at home for an effective leg massage. All these models are capable of offering a great advantage with the thighs, foot, calf, and ankle massage. And also promises to bring the massage experience of your legs to the next level. So, it’s up to you. Choose your favorite model and get an amazing experience of leg massage from the comfort of your home.